A client with a TEKLYNX CENTRAL installation needed to change the server location and database name. They used the database as a data source for multiple label designs. Thus, this change would effect many label files. Plus, TEKLYNX CENTRAL locks the label design settings for each approved label (as does LABEL ARCHIVE). Therefore, they needed a way to update the database data source settings with as little effort (i.e. avoid changing and re-approving labels) as possible. TEKLYNX products, including CODESOFT, save the name and location of database connection settings inside the label file. Therefore, if the client creates a new connection for a new or moved database, they must update each one. That means they need open, change (using the Administrator OLE DB), and save each label separately pointing it to the new OLEDB connection settings. In a controlled system such as TEKLYNX CENTRAL or LABEL ARCHIVE, the client faces more hurdles. These two applications will not allow the user to update an approved label without going through a process. This process includes changing the label version and going through the approval process configured within the software. This chore is compounded by the need, in most regulated industries, to follow other QA/QC change control procedures for testing and documenting the label change. 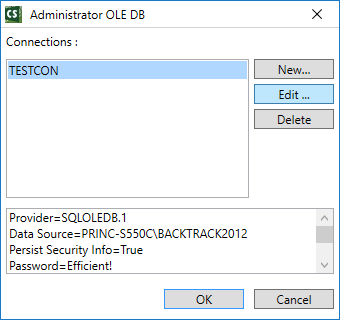 The client can take a clever approach by updating the existing OLEDB or ODBC settings directly. This effectively removes the need to create new database connections. Thus by updating the existing connections instead of the label itself, all the labels effectively get updated at once. They avoid the need to open, change, save, and possibly re-approve the label design files individually.